Indicate by check mark whether the registrant (1) has filed all reports required to be filed by Section 13 or 15(d) of the Securities Exchange Act of 1934 during the preceding 12 months (or for such shorter period that the registrant was required to file such reports), and (2) has been subject to the filing requirements for at least the past 90 days. The aggregate market value of the registrants’ voting common stock held by non-affiliates at December 31, 2017 was $2,391,170,747, based on the closing price per share of the registrant’s common stock on that date of $50.99 as reported on the New York Stock Exchange. As of August 8, 2018, 47,260,079 shares of the registrant’s common stock were outstanding. Selected portions of the Company’s fiscal year 2018 definitive Proxy Statement are incorporated by reference into Part III of this Report. Carpenter Technology Corporation, founded in 1889, is engaged in the manufacturing, fabrication and distribution of specialty metals. As used throughout this report, unless the context requires otherwise, the terms “Carpenter”, “Company”, “Registrant”, “Issuer”, “we” and “our” refer to Carpenter Technology Corporation. We are organized in two reportable business segments: Specialty Alloys Operations (“SAO”) and Performance Engineered Products (“PEP”). See Note 19 to our consolidated financial statements included in Item 8. “Financial Statements and Supplementary Data” for additional segment reporting information. We are a recognized leader in high-performance specialty alloy-based materials and process solutions for critical applications in the aerospace, defense, transportation, energy, industrial, medical, and consumer end-use markets. We have evolved to become a pioneer in premium specialty alloys, including titanium, nickel, and cobalt, as well as alloys specifically engineered for additive manufacturing processes and soft magnetics applications. We have expanded our additive manufacturing capabilities to provide a complete “end-to-end” solution to accelerate materials innovation and streamline parts production. The SAO segment is comprised of the Company’s major premium alloy and stainless steel manufacturing operations. This includes operations performed at mills primarily in Reading and Latrobe, Pennsylvania and surrounding areas as well as South Carolina and Alabama. The combined assets of the SAO segment are managed in an integrated manner to optimize efficiency and profitability across the total system. The PEP segment is comprised of the Company’s differentiated operations. This segment includes the Dynamet titanium business, the Carpenter Powder Products business, the Amega West business, the CalRAM business, and the Latrobe and Mexico distribution businesses. The businesses in the PEP segment are managed with an entrepreneurial structure to promote speed and flexibility, and drive overall revenue and profit growth. Our business depends on continued receipt of critical raw materials for our day-to-day operations. These raw materials include nickel, cobalt, chromium, manganese, molybdenum, titanium, iron and scrap containing iron and nickel. Some of the sources of these raw materials, many of which are international, could be subject to potential interruptions of supply as a result of political events, labor unrest or other reasons. These potential interruptions could cause material shortages and affect availability and price. We have arrangements with certain vendors to provide consigned materials at our manufacturing facilities available for our consumption as necessary. We have long-term relationships with major suppliers who provide availability of material at competitive prices. Purchase prices of certain raw materials have historically been volatile. We use pricing surcharges, indexing mechanisms, base price adjustments and raw material forward contracts to reduce the impact on our business of increased costs for the most significant of these materials. There can be delays between the time of the increase in the price of raw materials and the realization of the benefits of such mechanisms or actions that could have a short-term impact on our results and could affect the comparability of our results from period to period. We own a number of United States and international patents and have granted licenses under some of them. In addition, certain products that we produce are covered by patents held or owned by other companies from whom licenses have been obtained. The duration of a patent issued in the United States is between 14 and 20 years from the date of filing a patent application or issuance of the patents. The durations of patents issued outside of the United States varies from country to country. Generally, patent licenses are structured to match the duration of the underlying patent. Although these patents and licenses are believed to be of value, we do not consider our business to be materially dependent upon any single such item or related group of such items. Our sales are normally influenced by seasonal factors. Historically, our sales in the first two fiscal quarters (the respective three months ending September 30 and December 31) are typically the lowest — principally because of annual plant vacation and maintenance shutdowns by us, as well as by many of our customers. However, the timing of major changes in the general economy or the markets for certain products can alter this historical pattern. On a consolidated basis, we are not dependent upon a single customer, or a very few customers, such that the loss of any one or more particular customers would have a materially adverse effect on our consolidated statement of income. One customer, Arconic, Inc., accounted for approximately 12 percent, 11 percent and 13 percent of net sales for the years ended June 30, 2018, 2017 and 2016, respectively. No single customer accounted for 10 percent or more of the accounts receivable outstanding at June 30, 2018 and 2017. See Note 19 to our consolidated financial statements included in Item 8. “Financial Statements and Supplementary Data” for additional information. As of June 30, 2018, we had a sales backlog of orders excluding surcharge, believed to be firm, of approximately $568 million, substantially all of which is expected to be shipped within fiscal year 2019. Our backlog of orders excluding surcharge as of June 30, 2017 was approximately $438 million. We are leaders in specialty materials for critical applications with over 125 years of metallurgical and manufacturing expertise. Our business is highly competitive. We manufacture and supply materials to a variety of end-use market sectors and compete with various companies depending on end-use market, product or geography. A significant portion of the products we produce are highly engineered materials for demanding applications. There are less than ten companies producing one or more similar products that we consider our major competitors for our high-value products used in demanding applications, particularly in our Aerospace and Defense and Energy end-use markets. These products are generally required to meet complex customer product specifications and often require the materials to be qualified prior to supplying the customer. Our experience, technical capabilities, product offerings and research and development efforts represent barriers to existing and potential competitors. For other products, there are several dozen smaller producing companies and converting companies that are also competitors, as well as several hundred independent distributors of products similar to those distributed by us. Additionally, numerous foreign companies produce various specialty metal products similar to those produced by us. Furthermore, a number of different products may, in certain instances, be substituted for our finished products. Our expenditures for company-sponsored research and development were $19.3 million, $16.9 million and $16.3 million in fiscal years 2018, 2017 and 2016, respectively. We believe that our ability to be an innovator in special material development and manufacturing processes has been and will continue to be an important factor in the success of the Company. Our worldwide staff of expert metallurgists, research and development scientists, engineers and service professionals work closely with our customers to identify and provide innovative solutions to specific product requirements. We are subject to various stringent federal, state, local and international environmental laws and regulations relating to pollution, protection of public health and the environment, natural resource damages and occupational safety and health. Management evaluates the liability for future environmental remediation costs on a quarterly basis. We accrue amounts for environmental remediation costs representing management’s best estimate of the probable and reasonably estimable costs relating to environmental remediation. For further information on environmental remediation, see the Contingencies section included in Item 7. “Management’s Discussion and Analysis of Financial Condition and Results of Operations” and the notes to our consolidated financial statements included in Item 8. “Financial Statements and Supplementary Data”. Our costs of maintaining and operating environmental control equipment were $13.0 million, $12.4 million and $13.5 million for fiscal years 2018, 2017 and 2016, respectively. The capital expenditures for environmental control equipment were $1.2 million, $0.8 million and $0.7 million for fiscal years 2018, 2017 and 2016, respectively. We anticipate spending approximately $6 million on major domestic environmental capital projects over the next five fiscal years. This includes approximately $3 million in fiscal year 2019. Due to the possibility of future regulatory developments, the amount of future capital expenditures may vary from these estimates. As of June 30, 2018, our total workforce consisted of approximately 4,800 employees, which included approximately 130 production employees in Washington, Pennsylvania, who are covered under a collective bargaining agreement which expires on August 31, 2019, and approximately 490 employees in Latrobe, Pennsylvania who are covered under a collective bargaining agreement which expires August 1, 2020. Our relations with our employees are generally good. Sales outside of the United States, including export sales, were $728.3 million, $599.3 million and $569.9 million in fiscal years 2018, 2017 and 2016, respectively. Long-lived assets held outside of the United States were $27.0 million and $26.1 million as of June 30, 2018 and 2017, respectively. For further information on domestic and international sales, see Note 19 to our consolidated financial statements included in Item 8. “Financial Statements and Supplementary Data”. Our Board of Directors has adopted a Code of Ethics for the Chief Executive Officer and Senior Financial Officer of Carpenter Technology Corporation, which is also applicable to our other executive officers. There were no waivers of the Code of Ethics in fiscal year 2018. The Code of Ethics and any information regarding any waivers of the Code of Ethics are disclosed on Carpenter’s website at www.cartech.com. Our annual reports on Form 10-K, quarterly reports on Form 10-Q and current reports on Form 8-K filed or furnished pursuant to Section 13(a) or 15(d) of the Securities Exchange Act of 1934 are available free of charge through our website as soon as reasonably practicable after we electronically file such material with, or furnish such material to, the Securities and Exchange Commission (“SEC”). Our website and the content contained therein or connected thereto are not intended to be incorporated into this Annual Report on Form 10-K. The public may read and copy any materials the Company files with the SEC at the SEC’s Public Reference Room at 100 F Street, N.E., Washington, DC 20549. The public may obtain information on the operation of the Public Reference Room by calling the SEC at 1-800-SEC-0330. The SEC also maintains an Internet site that contains reports, proxy and other information regarding issuers that file electronically. Such information can be accessed through the Internet at www.sec.gov. There are inherent risks and uncertainties associated with all businesses that could adversely affect operating performances or financial conditions. The following discussion outlines the risks and uncertainties that management believes are the most material to our business. However, these are not the only risks or uncertainties that could affect our business. Certain risks are associated specifically with our business, industry or customer base, while others have a broader effect. The demand for certain products we produce may be cyclical. Demand in our end-use markets can be cyclical in nature and sensitive to general economic conditions, competitive influences and fluctuations in inventory levels throughout the supply chain. As such, our results of operations, financial condition, cash flows and availability of credit could fluctuate significantly from period to period. A significant portion of our sales represents products sold to customers in the commercial aerospace and defense and energy markets. The cyclicality of those markets can adversely affect our current business and our expansion objectives. The commercial aerospace and defense market is historically cyclical due to both external and internal market factors. These factors include general economic conditions, airline profitability, consumer demand for air travel, varying fuel and labor costs, price competition and international and domestic political conditions such as military conflict and the threat of terrorism. The length and degree of cyclical fluctuation can be influenced by any one or combination of these factors and therefore are difficult to predict with certainty. A downturn in the commercial aerospace and defense industry would adversely affect the demand for our products and/or the prices at which we are able to sell our products; our results of operations and financial condition could be materially adversely affected. The energy market has also been historically cyclical, principally as a result of volatile oil prices that impact demand for our products. Our future success requires us to, among other things, expand in key international energy markets by successfully adding to our customer base, distribution channels and product portfolio. The volatility of oil prices and other factors that contribute to the cyclicality of the energy market will impact our ability to expand successfully in this area and may adversely affect our results of operations and financial condition. Any significant delay or inability to successfully expand our operations in a timely and cost-effective manner could materially adversely affect our business, financial condition and results of operations. Over the last few years, we have undertaken capital projects associated with expanding our production capacity and capability. These projects place a significant demand on management and operational resources. Our success in expanding our operations in a cost-effective manner depends upon numerous factors including the ability of management to ensure the necessary resources are in place to properly execute these projects, our ability to obtain the necessary internal and customer qualifications to produce material from the facilities and our ability to operate the facilities to maximize the potential opportunities with minimal impacts to our existing operations. If we are not able to achieve the anticipated results from our capital expansion projects, or if we incur unanticipated excess costs, our results of operations and financial position may be materially adversely affected. Periods of reduced demand and excess supply as well as the availability of substitute lower cost materials can adversely affect our ability to price and sell our products at the profitability levels we require to be successful. Additional worldwide capacity and reduced demand for our products could significantly impact future worldwide pricing which would adversely impact our results of operations and financial condition. In addition, continued availability of lower cost, substitute materials may cause significant fluctuations in future results as our customers opt for a lower cost alternative. We change prices on our products as we deem necessary. In addition to the above general competitive impact, other market conditions and various economic factors beyond our control can adversely affect the timing of our pricing actions. The effects of any pricing actions may be delayed due to long manufacturing lead times or the terms of existing contracts. There is no guarantee that the pricing actions we implement will be effective in maintaining the Company’s profit margin levels. We rely on third parties to supply certain raw materials that are critical to the manufacture of our products and we may not be able to access alternative sources of these raw materials if the suppliers are unwilling or unable to meet our demand. Costs of certain critical raw materials, such as nickel, cobalt, chromium, manganese, molybdenum, titanium, iron and scrap containing iron and nickel have been volatile due to factors beyond our control. We are able to mitigate most of the adverse impact of rising raw material costs through raw material surcharges, indices to customers and raw material forward contracts, but changes in business conditions could adversely affect our ability to recover rapid increases in raw material costs and may adversely affect our results of operations. In addition, the availability of these critical raw materials is subject to factors that are not in our control. In some cases, these critical raw materials are purchased from suppliers operating in countries that may be subject to unstable political and economic conditions. At any given time, we may be unable to obtain an adequate supply of these critical raw materials on a timely basis, at prices and other terms acceptable to us, or at all. If suppliers increase the price of critical raw materials or are unwilling or unable to meet our demand, we may not have alternative sources of supply. In addition, to the extent that we have quoted prices to customers and accepted customer orders for products prior to purchasing necessary raw materials, or have existing contracts, we may be unable to raise the price of products to cover all or part of the increased cost of the raw materials to our customers. The manufacture of some of our products is a complex process and requires long lead times. As a result, we may experience delays or shortages in the supply of raw materials. If unable to obtain adequate and timely receipts of required raw materials, we may be unable to timely manufacture sufficient quantities of products. This could cause us to lose sales, incur additional costs, delay new product introductions or suffer harm to our reputation. We provide benefits to active and retired employees throughout most of our Company, most of which are not covered by insurance; and thus, our financial condition can be adversely affected if our investment returns are insufficient to meet these obligations. We have obligations to provide substantial benefits to active and retired employees, and most of the associated costs are paid by the Company and are not covered by insurance. In addition, certain employees are covered by defined benefit pension plans, with the majority of our plans covering employees in the United States. Benefits accrued to eligible participants of our largest qualified defined benefit pension plan and certain non-qualified pension plans were frozen effective December 31, 2016. Many domestic and international competitors do not provide defined benefit plans and/or retiree health care plans, and other international competitors operate in jurisdictions with government sponsored health care plans that may offer them a cost advantage. A decline in the value of plan investments in the future, an increase in costs or liabilities or unfavorable changes in laws or regulations that govern pension plan funding could materially change the timing and amount of required pension funding. A requirement to accelerate or increase pension contributions in the future could have a material adverse effect on our results of operations and financial condition. The extensive environmental, health and safety regulatory regimes applicable to our manufacturing operations create potential exposure to significant liabilities. The nature of our manufacturing business subjects our operations to numerous and varied federal, state, local and international laws and regulations relating to pollution, protection of public health and the environment, natural resource damages and occupational safety and health. We have used, and currently use and manufacture, substantial quantities of substances that are considered hazardous, extremely hazardous or toxic under worker safety and health laws and regulations. Although we implement controls and procedures designed to reduce continuing risk of adverse impacts and health and safety issues, we could incur substantial cleanup costs, fines and civil or criminal sanctions, third party property damage or personal injury claims as a result of violations, non-compliance or liabilities under these regulatory regimes required at our facilities. We have environmental remediation liabilities at some of our owned operating facilities and have been designated as a potentially responsible party (“PRP”) with respect to certain third party Superfund or similar waste disposal sites and other third party owned sites. Additionally, we have been notified that we may be a PRP with respect to other Superfund sites as to which no proceedings have been instituted against us. From time to time, we are a party to lawsuits and other proceedings involving alleged violations of, or liabilities arising from, environmental laws. When our liability is probable and we can reasonably estimate our costs, we record environmental liabilities in our financial statements. However, in many cases, we are not able to determine whether we are liable, or if liability is probable, in order to reasonably estimate the loss or range of loss which could result from such environmental liabilities. Estimates of our liability remain subject to additional uncertainties, including the nature and extent of site contamination, available remediation alternatives, the extent of corrective actions that may be required, and the number and financial condition of other PRPs, as well as the extent of their responsibility for the remediation. We adjust our accruals to reflect new information as appropriate. Future adjustments could have a material adverse effect on our results of operations in a given period, but we cannot reliably predict the amounts of such future adjustments. Future developments, administrative actions or liabilities relating to environmental matters could have a material adverse effect on our financial condition, cash flows or results of operations. Our manufacturing processes, and the manufacturing processes of many of our suppliers and customers, are energy intensive and generate carbon dioxide and other “Greenhouse Gases”, and pending legislation or regulation of Greenhouse Gases, if enacted or adopted in an onerous form, could have a material adverse impact on our results of operations, financial condition and cash flows. Political and scientific debates related to the impacts of greenhouse gas emissions on the global climate are prevalent. Regulation or some form of legislation aimed at reducing the greenhouse gas emissions is currently being considered both in the United States and globally. As a specialty alloy manufacturer, we will be affected, both directly and indirectly, if climate change legislation, such as use of a “cap and trade” and the signed Paris climate accord, is enacted and implemented. Such legislation could have a material adverse impact on our results of operations, financial condition and cash flows. Product liability and product quality claims could adversely affect our operating results. We produce ultra-high strength, high temperature and corrosion-resistant alloys designed for our customers’ demanding applications particularly in our Aerospace and Defense, Energy and Medical end-use markets. Failure of the materials that are included in our customers’ applications could give rise to substantial product liability claims. There can be no assurance that our insurance coverage will be adequate or continue to be available on terms acceptable to us. We have a complex manufacturing process necessary to meet our customers’ stringent product specifications. We are also required to adhere to various third party quality certifications and perform sufficient internal quality reviews to ensure compliance with established standards. If we fail to meet the customer specifications for their products, we may be subject to product quality costs and claims. These costs are generally not insured. The impacts of product liability and quality claims could have a material adverse impact on the results of our operations, financial condition and cash flows. Our business subjects us to risks of litigation claims, as a routine matter, and this risk increases the potential for a loss that might not be covered by insurance. Litigation claims relate to the conduct of our currently and formerly owned businesses, including claims pertaining to product liability, commercial disputes, employment actions, employee benefits, compliance with domestic and federal laws, personal injury, patent infringement and tax issues. Due to the uncertainties of litigation, we can give no assurance that we will prevail on claims made against us in the lawsuits that we currently face or that additional claims will not be made against us in the future. The outcome of litigation cannot be predicted with certainty, and some of these lawsuits, claims or proceedings may be determined adversely to us. The resolution in any reporting period of one or more of these matters could have a material adverse effect on our results of operations for that period. We can give no assurance that any other matters brought in the future will not have a material effect on our results of operations, financial condition and cash flows. A portion of our workforce is covered by collective bargaining agreements and union attempts to organize our other employees may cause work interruptions or stoppages. Approximately 130 production employees at our Dynamet business unit located in Washington, Pennsylvania are covered by a collective bargaining agreement. This agreement expires in August 2019. Approximately 490 production employees at our Latrobe business unit located in Latrobe, Pennsylvania are covered by a collective bargaining agreement. This agreement expires in August 2020. There can be no assurance that we will succeed in concluding collective bargaining agreements with the unions to replace those that expire which could result in work interruptions and stoppages. From time to time, the employees at our manufacturing facility in Reading, Pennsylvania, participate in election campaigns or union organizing attempts. There is no guarantee that future organization attempts will not result in union representation. Our manufacturing processes are complex and depend upon critical, high cost equipment for which there may be only limited or no production alternatives. It is possible that we could experience prolonged periods of reduced production due to unplanned equipment failures, and we could incur significant repair or replacement costs in the event of those failures. It is also possible that operations could be disrupted due to other unforeseen circumstances such as power outages, explosions, fires, floods, accidents and severe weather conditions. We must make regular, substantial capital investments and changes to our manufacturing processes to lower production costs, improve productivity, manufacture new or improved products and remain competitive. We may not be in a position to take advantage of business opportunities or respond to competitive pressures if we fail to update, replace or make additions to our equipment or our manufacturing processes in a timely manner. The cost to repair or replace much of our equipment or facilities would be significant. We cannot be certain that we will have sufficient internally generated cash or acceptable external financing to make necessary capital expenditures in the future. A significant portion of our manufacturing and production facilities are located in Reading and Latrobe, Pennsylvania and Athens, Alabama, which increases our exposure to significant disruption to our business as a result of unforeseeable developments in these geographic areas. It is possible that we could experience prolonged periods of reduced production due to unforeseen catastrophic events occurring in or around our manufacturing facilities in Reading and Latrobe, Pennsylvania and Athens, Alabama. As a result, we may be unable to shift manufacturing capabilities to alternate locations, accept materials from suppliers, meet customer shipment needs or address other severe consequences that may be encountered. Our financial condition, cash flows and results of operations could be materially adversely affected. We rely on third parties to supply energy consumed at each of our energy-intensive production facilities. The prices for and availability of electricity, natural gas, oil and other energy resources are subject to volatile market conditions. These market conditions often are affected by political and economic factors beyond our control. Disruptions or lack of availability in the supply of energy resources could temporarily impair the ability to operate our production facilities. Further, increases in energy costs, or changes in costs relative to energy costs paid by competitors, has affected and may continue to adversely affect our profitability. To the extent that these uncertainties cause suppliers and customers to be more cost sensitive, increased energy prices may have an adverse effect on our results of operations, financial condition and cash flows. We consider acquisitions, joint ventures and other business combination opportunities, as well as possible business unit dispositions, as part of our overall business strategy, that involve uncertainties and potential risks that we cannot predict or anticipate fully. From time to time, management holds discussions with management of other companies to explore such aforementioned opportunities. As a result, the relative makeup of the businesses comprising our Company is subject to change. Acquisitions, joint ventures and other business combinations involve various inherent risks. Such risks include difficulties in integrating the operations, technologies, products and personnel of the acquired companies, diversion of management’s attention from existing operations, difficulties in entering markets in which we have limited or no direct prior experience, dependence on unfamiliar supply chains, insufficient revenues to offset increased expenses associated with acquisitions, loss of key employees of the acquired companies, inaccurate assessment of undisclosed liabilities, difficulties in realizing projected efficiencies, synergies and cost savings, and increases in our debt or limitation on our ability to access additional capital when needed. The SEC has promulgated final rules mandated by the Dodd-Frank Act regarding disclosure of the use of tin, tantalum, tungsten and gold, known as conflict minerals, in products manufactured by public companies. These rules require due diligence to determine whether such minerals originated from the Democratic Republic of Congo (the “DRC”) or an adjoining country and whether such minerals helped finance the armed conflict in the DRC. The Company timely filed its latest annual conflict minerals report required by the rules on May 10, 2018. There are costs associated with complying with these disclosure requirements going forward, including costs to determine the origin of conflict minerals used in our products. In addition, the implementation of these rules could adversely affect the sourcing, supply and pricing of materials used in our products. Also, we may face disqualification as a supplier for customers and reputational challenges if the due diligence procedures we continue to implement do not enable us to verify the origins for all conflict minerals or to determine that such minerals are DRC conflict-free. Our business may be impacted by external factors that we may not be able to control. War, civil conflict, terrorism, natural disasters and public health issues including domestic or international pandemic have caused and could cause damage or disruption to domestic or international commerce by creating economic or political uncertainties. Additionally, the volatility in the financial markets could negatively impact our business. These events could result in a decrease in demand for our products, affect the availability of credit facilities to us, our customers or other members of the supply chain necessary to transact business, make it difficult or impossible to deliver orders to customers or receive materials from suppliers, affect the availability or pricing of energy sources or result in other severe consequences that may or may not be predictable. As a result, our business, financial condition and results of operations could be materially adversely affected. We believe that international sales, which are associated with various risks, will continue to account for a significant percentage of our future revenues. Risks associated with international sales include without limitation: political and economic instability, including weak conditions in the world’s economies; difficulty in collecting accounts receivable; unstable or unenforced export controls; changes in legal and regulatory requirements; policy changes affecting the markets for our products; changes in duties, quotas, tariffs and taxes; and exchange rate fluctuations (which may affect sales to international customers and the value of profits earned on international sales when converted into dollars). In addition, we will need to invest in building our capabilities and infrastructure to meet our international growth goals. Any of these factors could materially adversely affect our results for the period in which they occur. We value most of our inventory using the LIFO method, which could be repealed resulting in adverse effects on our cash flows and financial condition. The cost of our inventories is primarily determined using the Last-In, First-Out (“LIFO”) method. Under the LIFO inventory valuation method, changes in the cost of raw materials and production activities are recognized in cost of sales in the current period even though these materials and other costs may have been incurred at significantly different values due to the length of time of our production cycle. Generally, in a period of rising prices, LIFO recognizes higher costs of goods sold, which both reduces current income and assigns a lower value to the year-end inventory. From time to time, there have been proposals aimed at repealing the election to use the LIFO method for income tax purposes. According to these proposals, generally taxpayers that currently use the LIFO method would be required to revalue their LIFO inventory to its First-In, First-Out (“FIFO”) value. As of June 30, 2018, if the FIFO method of inventory had been used instead of the LIFO method, our inventories would have been approximately $210 million higher. This increase in inventory would result in a one-time increase in taxable income which may be taken into account over the following several taxable years. The repeal of the LIFO method could result in a substantial tax liability which could adversely impact our cash flows and financial condition. We depend on the retention of key personnel. Much of our future success depends on the continued service and availability of skilled personnel, including members of our executive management team, management, metallurgists and production positions. The loss of key personnel could adversely affect our ability to perform until suitable replacements are found. We could be adversely impacted if our information technology (“IT”) and computer systems do not perform properly or if we fail to protect the integrity of confidential data. Management relies extensively on IT infrastructure, including hardware, network, software, people and processes, to provide useful information to conduct our business and support assessments and conclusions about operating performance. Our inability to produce relevant and/or reliable measures of operating performance in an efficient, cost-effective and well-controlled fashion may have significant negative impacts on our future operations. In addition, any material failure, interruption of service, or compromised data security could adversely affect our operations. Security breaches in our information technology could result in theft, destruction, loss, misappropriation or release of confidential data or intellectual property which could adversely impact our future results. We are engaged in a multi-year implementation of a global enterprise resource planning (ERP) system which is planned to be deployed in phases. The new ERP system will replace multiple current business systems and is being designed to improve manufacturing planning, development and processes, accurately maintain books and records, record transactions and provide important information of the operations of our business to our management. The implementation of the new ERP system has required, and will continue to require, the investment of significant financial resources as well as a considerable allocation of personnel for the project. While we have invested, and continue to invest, significant resources in planning and project management, implementation issues may arise during the course of implementing the ERP system, and it is possible that we may experience significant delays, increased costs and other difficulties that are not presently contemplated. Any disruptions, delays or deficiencies in the design and implementation of the new ERP system could adversely affect our financial condition and results of operations. The carrying value of goodwill and other intangible assets may not be recoverable. Goodwill and other long-lived assets including property, plant and equipment and other intangible assets are recorded at fair value on the date of acquisition. We review these assets at least annually for impairment. Impairment may result from, among other things, deterioration in performance, adverse market conditions, adverse changes in applicable laws or regulations and a variety of other factors. Any future impairment of goodwill or other long-lived assets could have a material adverse effect on our results of operations. The principal locations of our primary domestic integrated mills in our SAO segment are located in Reading and Latrobe, Pennsylvania and Athens, Alabama. In addition, SAO manufactures large diameter hollow bar in Orwigsburg, Pennsylvania and Elyria, Ohio and operates a mini mill manufacturing stainless steel bar and wire in Hartsville, South Carolina. The principal locations for PEP businesses include titanium alloy production facilities located in Washington, Pennsylvania and Clearwater, Florida, powder products manufacturing facilities in Bridgeville, Pennsylvania, Athens, Alabama, Woonsocket, Rhode Island and Bruceton Mills, West Virginia, additive manufacturing facility in Camarillo, California and a facility in Houston, Texas for manufacturing of machined components used in the drilling, exploration and production of oil and gas. The PEP segment also includes domestic leased warehouses and service centers located in Houston, Texas; San Antonio, Texas; Midland, Texas; Oklahoma City, Oklahoma; Casper, Wyoming; Lafayette, Louisiana; West Alexander, Pennsylvania; Vienna, Ohio and Chicago, Illinois. The PEP segment includes one owned service center in White House, Tennessee. The Reading, Hartsville, Washington, Bridgeville, Orwigsburg, Elyria, Woonsocket, Latrobe, Houston and Athens facilities are owned. The Clearwater facility is owned, but the land is leased. We also own or lease manufacturing facilities, distribution centers, service centers and sales offices in a number of foreign countries, including Sweden, Canada, Singapore, China, Mexico, Taiwan, the United Arab Emirates and Belgium. Our corporate offices, located in Philadelphia, Pennsylvania, are leased. Our plants, customer service centers and distribution centers were acquired or leased at various times over several years. There is an active maintenance program to ensure a safe operating environment and to keep facilities in good condition. In addition, we have an active capital spending program to replace equipment as needed to keep it technologically competitive on a worldwide basis. We believe our facilities are in good condition and suitable for our business needs. From time to time, we are a party to lawsuits and other proceedings involving alleged violations of, or liabilities arising from, environmental laws. We have environmental remediation liabilities at some of our owned operating facilities and have been designated as a PRP with respect to certain third party Superfund or similar waste disposal sites and other third party owned sites. Additionally, we have been notified that we may be a PRP with respect to other Superfund sites as to which no proceedings have been instituted against us. Estimates of the amount and timing of future costs of environmental remediation requirements are inherently imprecise because of the continuing evolution of environmental laws and regulatory requirements, the availability and application of technology, the identification of currently unknown remediation sites and the allocation of costs among the PRP’s. Based upon information currently available, such future costs are not expected to have a material effect on our financial position, results of operations or cash flows over the long-term. However, such costs could be material to our financial position, results of operations or cash flows in a particular future quarter or year. In addition, from time to time, we are a party to certain routine claims and legal actions and other contingent liabilities incident to the normal course of business which pertain to litigation, product claims, commercial disputes, employment actions, employee benefits, compliance with domestic and foreign laws, personal injury claims, patent infringement and tax issues. Based on information currently available, the ultimate resolution of our known contingencies, individually or in the aggregate and including the matters described in Note 11 to the consolidated financial statements in this Form 10-K, is not expected to have a material adverse effect on our financial position, cash flows or results of operations. However, there can be no assurance that an increase in the scope of pending matters or that any future lawsuits, claims, proceedings or investigations will not be material to our financial position, results of operations or cash flows in a particular future quarter or year. See the “Contingencies” section included in Item 7. “Management’s Discussion and Analysis of Financial Condition and Results of Operation”, and the “Contingencies and Commitments” section included in Note 11 to our consolidated financial statements included in Item 8. “Financial Statements and Supplementary Data”, included in this Form 10-K, the contents of which are incorporated by reference to this Item 3. Listed below are the names of our corporate executive officers, including those required to be listed as executive officers for SEC purposes, each of whom assumes office after the annual organization meeting of the Board of Directors which immediately follows the Annual Meeting of Stockholders. Tony R. Thene was appointed President and Chief Executive Officer effective July 1, 2015. Mr. Thene joined Carpenter in January 2013 and served as the Senior Vice President and Chief Financial Officer. Prior to joining Carpenter, Mr. Thene was employed for 23 years by Alcoa Inc., a leading producer of primary and fabricated aluminum, holding various management positions. Damon J. Audia was appointed Senior Vice President and Chief Financial Officer effective October 19, 2015. Mr. Audia joined Carpenter from The Goodyear Tire & Rubber Company where he worked for ten years and most recently served as Senior Vice President of Finance for the company's North America division. On August 8, 2018 it was announced that Mr. Audia would be leaving the Company for another role effective September 14, 2018. Joseph E. Haniford was appointed Senior Vice President and Chief Operating Officer effective June 30, 2016. Mr. Haniford joined Carpenter in July 2015 and served as Senior Vice President - Specialty Alloys Operations. Prior to Carpenter, Mr. Haniford was employed by EnTrans International where he was responsible for all operations as the company's Chief Operating Officer and was a member of the Board of Directors. Prior to EnTrans International, Mr. Haniford worked for Alcoa, Inc. for more than 30 years in various executive leadership positions. Effective July 1, 2018, Mr. Haniford assumed the role of Vice President, Business Management Office and Global Advanced Engineering. James D. Dee was appointed Vice President, General Counsel and Secretary effective September 13, 2010. Mr. Dee joined Carpenter from C&D Technologies where he last served as Senior Vice President, General Counsel, Secretary and Chief Administrative Officer at C&D Technologies. Prior to his tenure at C&D Technologies, Mr. Dee was employed by the law firm of Montgomery, McCracken, Walker & Rhodes, LLP. Mr. Dee also worked 16 years at SPS Technologies, Inc., where he last served as Vice President, General Counsel and Secretary. The range of our common stock price on the NYSE from July 2, 2018 to August 8, 2018 was $53.07 to $58.99. The closing price of the common stock was $58.35 on August 8, 2018. We have paid quarterly cash dividends on our common stock since1906. We paid a quarterly dividend of $0.18 per share of common stock during each quarter of fiscal years 2018 and 2017. As of August 8, 2018, there were 2,061 common stockholders of record. Information regarding Securities Authorized for Issuance under Equity Compensation Plans is set forth in Item 12 hereto “Security Ownership of Certain Beneficial Owners and Management and Related Stockholder Matters”. 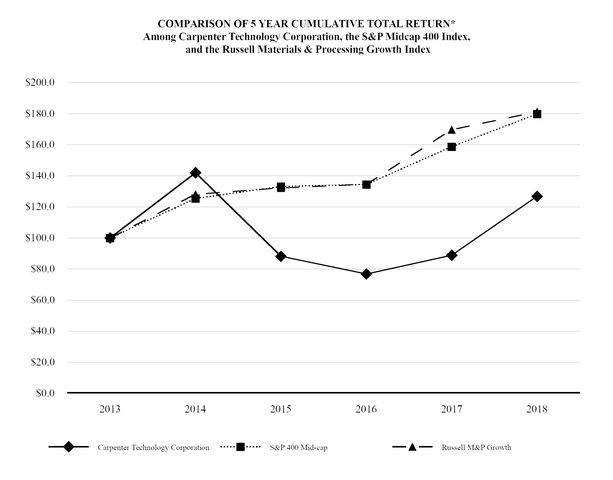 The graph below compares the cumulative total stockholder return on our common stock to the cumulative total return of the S&P MidCap 400 Index, the most widely used index for mid-sized companies, and our Peer Group, for each of the last five fiscal years ended June 30, 2018. The cumulative total return assumes an investment of $100 on June 30, 2013 and the reinvestment of any dividends during the period. Our Peer Group consists of the companies in the Russell RSCC Materials & Processing Growth Index. We believe the companies included in our Peer Group, taken as a whole, provide a more meaningful comparison in terms of product offerings, markets served, competition and other relevant factors. The total stockholder return for the peer group is weighted according to the respective issuer’s stock market capitalization at the beginning of each period. * $100 invested on June 30, 2013 in stock or index, including reinvestment of dividends. Fiscal year ending June 30. Employees surrendered 16,463 shares to the Company, at an average purchase price of $53.40, during the fourth quarter of fiscal year 2018, for the payment of the minimum tax liability withholding obligations upon the vesting of shares of restricted stock and the exercise of options. We do not consider this a share buyback program. (a) Fiscal year 2018 included $68.3 million of discrete income tax net benefits related to the U.S. tax reform and other legislative changes. See Note 17 in the Notes to the Consolidated Financial Statements included in Item 8 “Financial Statements and Supplementary Data” of this report. (b) Fiscal year 2017 included $3.2 million of loss on divestiture of business. See Note 2 in the Notes to the Consolidated Financial Statements included in Item 8 “Financial Statements and Supplementary Data” of this report. (c) Fiscal year 2016 included $22.5 million of excess inventory write-down charges, $12.5 million of goodwill impairment charges and $18.0 million of restructuring and impairment charges including $7.6 million of impairment of intangible assets and property, plant and equipment and $10.4 million of restructuring costs related primarily to an early retirement incentive and other severance related costs. See Note 3 in the Notes to the Consolidated Financial Statements included in Item 8 “Financial Statements and Supplementary Data” of this report. (d) Fiscal year 2015 included $29.1 million of restructuring costs related principally to workforce reduction, facility closures and write-down of certain assets. (e) The weighted average common shares outstanding for fiscal years 2016 and 2015 included 5.5 million and 0.9 million less shares, respectively, related to the share repurchase program authorized in October 2014. During the fiscal years ended June 30, 2016 and 2015, we repurchased 3,762,200 shares and 2,995,272 shares, respectively, of common stock for $123.9 million and $124.5 million, respectively. See Item 7. “Management’s Discussion and Analysis of Financial Condition and Results of Operations” for discussion of factors that affect the comparability of the “Selected Financial Data”. Our discussions below in this Item 7 should be read in conjunction with our consolidated financial statements, including the notes thereto, included in this annual report on Form 10-K.
We are a producer and distributor of premium specialty alloys, including titanium alloys, powder metals, stainless steels, alloy steels, and tool steels as well as drilling tools. We are a recognized leader in high-performance specialty alloy-based materials and process solutions for critical applications in the aerospace, defense, transportation, energy, medical, industrial, and consumer markets. We have evolved to become a pioneer in premium specialty alloys, including titanium, nickel, and cobalt, as well as alloys specifically engineered for additive manufacturing (AM) processes and soft magnetics applications. We have expanded our AM capabilities to provide a complete “end-to-end” solution to accelerate materials innovation and streamline parts production. We primarily process basic raw materials such as nickel, cobalt, titanium, manganese, chromium, molybdenum, iron scrap and other metal alloying elements through various melting, hot forming and cold working facilities to produce finished products in the form of billet, bar, rod, wire and narrow strip in many sizes and finishes. We also produce certain metal powders and parts. Our sales are distributed directly from our production plants and distribution network as well as through independent distributors. Unlike many other specialty steel producers, we operate our own worldwide network of service and distribution centers. These service centers, located in the United States, Canada, Mexico, Europe and Asia allow us to work more closely with customers and to offer various just-in-time stocking programs. While we prepare our financial statements in accordance with U.S. generally accepted accounting principles (“U.S. GAAP”), we also utilize and present certain financial measures that are not based on or included in U.S. GAAP (we refer to these as “Non-GAAP financial measures”). Please see the section “Non-GAAP Financial Measures” below for further discussion of these financial measures, including the reasons why we use such financial measures and reconciliations of such financial measures to the nearest U.S. GAAP financial measures. (1) See the section “Non-GAAP Financial Measures” below for further discussion of these financial measures. (2) Includes pounds from Specialty Alloys Operations segment, and certain Performance Engineered Products segment businesses namely Dynamet and Carpenter Powder Products. We value most of our inventory utilizing LIFO inventory costing methodology. Under the LIFO inventory costing method, changes in the cost of raw materials and production activities are recognized in cost of sales in the current period even though these materials may have been acquired at potentially significantly different values due to the length of time from the acquisition of the raw materials to the sale of the processed finished goods to the customers. In a period of rising raw material costs, the LIFO inventory valuation normally results in higher cost of sales. Conversely, in a period of decreasing raw material costs, the LIFO inventory valuation normally results in lower cost of sales. Approximately 30 percent of our net sales are sales to customers under firm price sales arrangements. Firm price sales arrangements involve a risk of profit margin fluctuations, particularly when raw material prices are volatile. In order to reduce the risk of fluctuating profit margins on these sales, we enter into commodity forward contracts to purchase certain critical raw materials necessary to produce the related products sold. Firm price sales arrangements generally include certain annual purchasing commitments and consumption schedules agreed to by the customers at selling prices based on raw material prices at the time the arrangements are established. If a customer fails to meet the volume commitments (or the consumption schedule deviates from the agreed-upon terms of the firm price sales arrangements), the Company may need to absorb the gains or losses associated with the commodity forward contracts on a temporary basis. Gains or losses associated with commodity forward contracts are reclassified to earnings/loss when earnings are impacted by the hedged transaction. Because we value most of our inventory under the LIFO costing methodology, changes in the cost of raw materials and production activities are recognized in cost of sales in the current period attempting to match the most recently incurred costs with revenues. Gains and/or losses on the commodity forward contracts are reclassified from other comprehensive income together with the actual purchase price of the underlying commodities when the underlying commodities are purchased and recorded in inventory. To the extent that the total purchase price of the commodities, inclusive of the gains or losses on the commodity forward contracts, are higher or lower relative to the beginning of year costs, our cost of goods sold reflects such amounts. Accordingly, the gains and/or losses associated with commodity forward contracts may not impact the same period that the firm price sales arrangements revenue is recognized, and comparisons of gross profit from period to period may be impacted. These firm price sales arrangements are expected to continue as we look to strengthen our long-term customer relationships by expanding, renewing and in certain cases extending to a longer term, our customer long-term arrangements. We produce hundreds of grades of materials, with a wide range of pricing and profit levels depending on the grade. In addition, our product mix within a period is subject to the fluctuating order patterns of our customers as well as decisions we may make on participation in certain products based on available capacity including the impacts of capacity commitments we may have under existing customer agreements. While we expect to see positive contribution from a more favorable product mix in our margin performance over time, the impact by period may fluctuate, and period-to-period comparisons may vary. In September 2016, we announced changes to retirement plans we offer to certain employees. Benefits accrued to eligible participants of our largest qualified defined benefit pension plan and certain non-qualified pension plans were frozen effective December 31, 2016. Approximately 1,900 affected employees were transitioned to the Company’s 401(k) plan that has been in effect for eligible employees since 2012, when the pension plan was closed to new entrants. We recognized the plan freeze during fiscal year 2017 as a curtailment, since it eliminated the accrual for a significant number of participants for all of their future services. We also made a voluntary pension contribution of $100.0 million to the affected plan in October 2016. As of June 30, 2018 and 2017, amounts capitalized in gross inventory were $1.7 million and $3.4 million, respectively. We expanded customer relationships through market share gains with new and existing customers based on the strength of our solutions focused customer approach. Through the ongoing implementation of the Carpenter Operating Model, we have unlocked incremental capacity through efficiency and productivity improvements across our SAO and PEP businesses. We submitted majority of Aerospace Vendor Approved Processes for Athens, AL facility and received certain approvals. We increased our focus and investment in core growth areas such as additive manufacturing and soft magnetics. For fiscal year 2018, we reported net income of $188.5 million, or $3.92 per diluted share. Excluding special items, earnings per share would have been $2.50 per diluted share for fiscal year 2018. This compares with net income of $47.0 million, or $0.99 per diluted share, a year earlier. Excluding special items, earnings per share would have been $1.08 per diluted share for fiscal year 2017. Our fiscal year 2018 results reflect strong market conditions combined with our solutions focused approach that drove increasing sales in all of our end-use markets and further implementation of the Carpenter Operating Model. Net sales for fiscal year 2018 were $2,157.7 million, which was a 20 percent increase from fiscal year 2017. Excluding surcharge revenue, sales were 15 percent higher than fiscal year 2017 on 12 percent higher volume. The results reflect stronger demand and improved product mix across certain end-use markets demonstrating our focus on high-value solutions and market share gain by deepening our existing relationships and adding new customers. Geographically, sales outside the United States increased 22 percent from fiscal year 2017 to $728.3 million. The increase is primarily due to stronger product demand in the Aerospace and Defense, Medical and Industrial and Consumer end-use markets in Europe and Asia Pacific. In addition, the Energy end-use market had stronger demand for oil and gas materials in Asia Pacific and Canada partially offset by weaker demand in Europe for power generation materials. A portion of our sales outside the United States are denominated in foreign currencies. The impact of fluctuations in foreign currency exchange rates resulted in a $9.3 million increase in sales during the fiscal year 2018 compared to fiscal year 2017. International sales as a percentage of our total net sales represented 34 percent and 33 percent for fiscal year 2018 and fiscal year 2017, respectively. We sell to customers across diversified end-use markets. The following table includes comparative information for our net sales, which includes surcharge revenue, by principal end-use markets. We believe this is helpful supplemental information in analyzing the performance of the business from period to period. Sales to the Aerospace and Defense market increased 21 percent from fiscal year 2017 to $1,182.3 million. Excluding surcharge revenue, sales increased 17 percent on 18 percent higher shipment volume. The results reflect the impact of stronger demand for materials used in aerospace engine and structural applications, the distribution sub-market and defense applications driven by specific programs partially offset by lower fastener sales. Sales to the Energy market of $146.5 million reflected a 6 percent increase from fiscal year 2017. Excluding surcharge revenue, sales increased 6 percent. The results were driven by an increase in the oil and gas sub-market, particularly rental and replacement activity through our Amega West Services (“Amega West”) business offset by weaker demand for materials used in power generation applications, which has been significantly impacted by depressed industrial gas turbine industry conditions. Transportation market sales increased 9 percent from fiscal year 2017 to $157.0 million. Excluding surcharge revenue, sales increased 4 percent on 1 percent higher shipment volume. The results reflect a strengthening mix of medium and heavy-duty truck applications, partially offset by softer demand in light duty vehicles applications. Sales to the Medical market increased 40 percent to $175.3 million from fiscal year 2017. Excluding surcharge revenue, sales increased 29 percent on 19 percent higher shipment volume. The results reflect improved product mix for higher value solutions, market share gains with key customers and the positive impact of supply chain inventory rebuilding for titanium materials within the orthopedic and cardiology sub-markets. Industrial and Consumer market sales increased 22 percent to $364.9 million for fiscal year 2018. Excluding surcharge revenue, sales increased 14 percent on 7 percent higher shipment volume. The results reflect the impact of stronger demand for materials used in industrial applications due in part to a moderate increase in recovery of oil and gas activity. Gross profit in fiscal year 2018 increased to $382.2 million, or 17.7 percent of net sales from $284.3 million, or 15.8 percent of net sales for fiscal year 2017. Excluding the impact of the surcharge revenue, our gross margin in fiscal year 2018 was 21.3 percent compared to 18.2 percent in fiscal year 2017. The results reflect the impact of stronger demand and improved product mix coupled with operating cost improvements compared to the same period a year ago. Our surcharge mechanism is structured to recover increases in raw material costs, although in certain cases with a lag effect as discussed above. While the surcharge generally protects the absolute gross profit dollars, it does have a dilutive effect on gross margin as a percent of sales. The following represents a summary of the dilutive impact of the surcharge on gross margin. We present and discuss these financial measures because management believes removing the impact of surcharge provides a more consistent and meaningful basis for comparing results of operations from period to period. See the section “Non-GAAP Financial Measures” below for further discussion of these financial measures. Selling, general and administrative expenses in fiscal year 2018 were $195.1 million, or 9.0 percent of net sales (10.9 percent of net sales excluding surcharge revenue), compared to $183.9 million, or 10.2 percent of net sales (11.8 percent of net sales excluding surcharge revenue), in fiscal year 2017. Selling, general and administrative expenses increased in fiscal year 2018 primarily due to higher variable compensation expense partially offset by lower pension expense compared to fiscal year 2017. Our operating income in fiscal year 2018 increased to $187.1 million, or 8.7 percent of net sales as compared with $97.2 million, or 5.4 percent of net sales in fiscal year 2017. Excluding surcharge revenue, pension EID and special items, operating margin was 10.6 percent for the fiscal year 2018 and 8.0 percent for the same period a year ago. The increase in the operating margin reflects the stronger demand and improved product mix coupled with operating cost improvements partially offset by higher variable compensation expense compared to the same period a year ago. Operating income has been significantly impacted by our pension EID, which may be volatile based on conditions in the financial markets, as well as special items. The following presents our operating income and operating margin, in each case excluding the impact of surcharge on net sales, pension EID and special items. We present and discuss these financial measures because management believes removing the impact of these items provides a more consistent and meaningful basis for comparing results of operations from period to period. See the section “Non-GAAP Financial Measures” below for further discussion of these financial measures. Fiscal year 2018 interest expense was $28.3 million compared to $29.8 million in fiscal year 2017. We have used interest rate swaps to achieve a level of floating rate debt to fixed rate debt. Interest expense for fiscal year 2018 includes net gains from interest rate swaps of $0.4 million compared with $1.8 million of net gains from interest rate swaps for the fiscal year 2017. Capitalized interest reduced interest expense by $2.8 million for fiscal year 2018 compared to $1.3 million in fiscal year 2017. Other income, net for fiscal year 2018 was $1.4 million as compared with other expense of $2.8 million a year ago. Our effective tax rate (income tax (benefit) expense as a percent of income before taxes) for fiscal year 2018 was negative 17.7 percent as compared to positive 33.0 percent in fiscal year 2017. Excluding the discrete tax benefits recorded in connection with U.S. Tax reform of $68.3 million that are discussed below, our effective tax rate for fiscal year 2018 would have been 25.0 percent. An Act to Provide for Reconciliation Pursuant to Titles II and V of the Concurrent Resolution on the Budget for Fiscal Year 2018 (the “Act”) was enacted on December 22, 2017. The Act includes provisions that reduce the federal corporate income tax rate, create a territorial tax system with a one-time mandatory tax on previously deferred foreign earnings (i.e transition tax), and change certain business deductions including allowing for immediate expensing of certain qualified capital expenditures and limitations on deductions of interest expense. The permanent reduction to the U.S. federal corporate income tax rate from 35 percent to 21 percent was effective January 1, 2018. Due to our fiscal year end, the lower U.S. statutory federal income tax rate resulted in a blended U.S. federal statutory rate of 28.1 percent for our fiscal year ending June 30, 2018. For fiscal year 2019, the U.S. federal statutory tax rate will be 21 percent. As of the date of enactment of the Act, we re-measured our deferred tax assets and liabilities and recorded a provisional net tax benefit of $74.6 million. While we were able to make a reasonable estimate of the impact of the reduction in the corporate tax rate, changes to estimates the Company has made to calculate existing temporary differences, among other items, may result in further adjustments to the amounts recorded. During fiscal year 2018 in connection with the Act, we also recorded a provisional tax charge of $5.0 million for the transition tax. The Company determined that the amounts recorded for the transition tax are provisional because various components of the computation are not yet finalized as of June 30, 2018, including the following significant items: the actual aggregate foreign cash position and the earnings and profits of the foreign entities as of June 30, 2018, the interpretation and identification of cash positions as of June 30, 2018, and computations of accumulated earnings and profits balances as of November 2, 2017 and December 31, 2017. Under the Act, the transition tax will be paid over an eight-year period beginning in fiscal year 2019. Fiscal year 2018 tax expense also includes a tax charge of $1.3 million for increases in certain state valuation allowances for deferred tax assets resulting from the impact of a state law change that will limit the Company’s ability to utilize state net operating loss carryforwards partially offset by the impact of limitations on interest expense as a result of the Act. As a result of the voluntary pension contribution, income tax expense for fiscal year 2017 includes a tax charge of $2.1 million due to reduced tax benefits for domestic manufacturing claimed in prior periods. The fiscal year 2017 tax rate also includes tax benefits of $0.9 million associated with the repatriation of earnings from one of our foreign subsidiaries and a tax charge of $0.9 million for prior year adjustments in various tax jurisdictions. Prior to the "Act", undistributed earnings of our foreign subsidiaries, totaling $93.8 million were considered permanently reinvested. We have accrued $5.0 million for the transition tax on these earnings. We are still in the process of evaluating our assertion for indefinite reinvestment. See Note 17 to the consolidated financial statements in Item 8, “Financial Statements and Supplementary Data” for a full reconciliation of the statutory federal tax rate to the effective tax rates. Summary information about our operating results on a segment basis is set forth below. For more detailed segment information, see Note 19 to the consolidated financial statements included in Item 8, “Financial Statements and Supplementary Data”. * Pounds sold data for PEP segment includes Dynamet and Carpenter Powder Products businesses only. Net sales in fiscal year 2018 for the SAO segment increased 23 percent to $1,803.8 million, as compared with $1,461.6 million in fiscal year 2017. Excluding surcharge revenue, net sales increased 17 percent from a year ago. The fiscal year 2018 net sales reflected 13 percent higher shipment volume as compared to fiscal year 2017. The results reflect the impact of stronger product demand driven by improving market conditions across our end-use markets compared to the prior year same period. Operating income for the SAO segment in fiscal year 2018 was $232.4 million, or 12.9 percent of net sales (16.2 percent of net sales excluding surcharge revenue), compared to $172.3 million, or 11.8 percent of net sales (14.1 percent of net sales excluding surcharge revenue), for fiscal year 2017. The increase in operating income reflects the impact of higher product demand and stronger product mix driven by improving market conditions across our end-use markets compared to the prior year same period. Net sales for fiscal year 2018 for the PEP segment were $429.7 million as compared with $366.6 million for fiscal year 2017. Excluding surcharge revenue, net sales increased 17 percent from a year ago. The results reflect an increase in sales primarily in the Energy and Medical end-use markets. Operating income for the PEP segment for fiscal year 2018 was $26.1 million, or 6.1 percent of net sales, as compared with operating income of $8.5 million, or 2.3 percent of net sales for fiscal year 2017. The results reflect the increasing demand for titanium products combined with ongoing improvements in our oil and gas businesses and cost reduction initiatives. For fiscal year 2017, we reported net income of $47.0 million, or $0.99 per diluted share, compared with net income of $11.3 million, or $0.23 per diluted share, a year earlier. Our fiscal year 2017 results reflect operating cost improvements driven by the implementation of the Carpenter Operating Model and improving market conditions in many of our end-use markets. In the Aerospace and Defense end-use market, we experienced increasing demand for our products across our diversified sub-markets, especially engines, where we saw strong order flows related to the next generation engines. We experienced similar momentum across other markets, such as the oil and gas sub-market, where our Amega West business continues to benefit from our investments in new products over the last several years. In addition, we saw stronger demand in both the Aerospace and Medical end-use markets for our titanium solutions. Our fiscal year 2016 results reflect non-cash impairment charges consisting of excess inventory write-down totaling $22.5 million, goodwill impairment charges totaling $12.5 million and impairment of intangible assets and property, plant and equipment charges totaling $7.6 million. Net sales for fiscal year 2017 were $1,797.6 million, which was a 1 percent decrease from fiscal year 2016. Excluding surcharge revenue, sales were 1 percent lower than fiscal year 2016 on 3 percent lower volume. The results reflect demand challenges in the first half of fiscal year 2017 offset by the improving demand conditions in the second half of fiscal year 2017 driven by the Aerospace and Defense end-use market. The year over year performance was also impacted by reduced ongoing weakness in demand for material used in the Transportation end-use market. Geographically, sales outside the United States increased 5 percent from fiscal year 2016 to $599.3 million. The increase is primarily due to sales to Europe in the Aerospace and Defense end-use market. A portion of our sales outside the United States are denominated in foreign currencies. The impact of fluctuations in foreign currency exchange rates resulted in a $5.1 million decrease in sales during the fiscal year 2017 compared to fiscal year 2016. International sales as a percentage of our total net sales represented 33 percent and 31 percent for fiscal year 2017 and fiscal year 2016, respectively. Sales to the Aerospace and Defense market decreased 1 percent from fiscal year 2016 to $973.3 million. Excluding surcharge revenue, sales were decreased 1 percent on 2 percent lower shipment volume. The results reflect the impact of increased new engine platform demand offset by a decrease in sales of material used for fasteners, structural and distribution applications due to supply chain consolidation. Sales to the Energy market of $138.0 million reflected a 6 percent increase from fiscal year 2016. Excluding surcharge revenue, sales increased 8 percent on 8 percent higher shipment volume. The results reflect strong demand for power generation materials during the first half of fiscal year 2017. In addition, we experienced an increase in demand during the second half of fiscal year 2017 driven by improved rental activity within the oil and gas businesses. The North American quarterly average directional and horizontal rig count, an indicator of drilling activity, increased 123 percent from fiscal year 2016. Transportation market sales decreased 10 percent from fiscal year 2016 to $143.9 million. Excluding surcharge revenue, sales decreased 10 percent on 14 percent lower shipment volume. The results reflect the impact of weaker demand as a result of ongoing weakness in production of passenger cars and heavy duty on-road and off-road trucks. Sales to the Medical market sales increased 3 percent to $125.5 million from fiscal year 2016. Excluding surcharge revenue, sales increased 1 percent on 2 percent higher shipment volume. The results reflect improving demand for materials used in cardiology and orthopedics applications in addition to more normalized buying patterns by distributors and OEMs as supply chain inventory levels appear to be stabilizing. Industrial and Consumer market sales decreased 1 percent to $298.2 million for fiscal year 2017. Excluding surcharge revenue, sales decreased 2 percent on flat shipment volume. The results reflect the impact of strong demand for materials used in consumer electronics, pumps, valves and fittings during the second half of fiscal year 2017 offset by weaker demand for industrial tooling. Gross profit in fiscal year 2017 increased to $284.3 million, or 15.8 percent of net sales from $255.9 million, or 14.1 percent of net sales for fiscal year 2016. During the year ended June 30, 2016, we recorded a $22.5 million excess inventory adjustment in our oil and gas businesses within the PEP segment due to the prolonged weakness in oil and gas businesses. Excluding the impacts of the excess inventory write-down and surcharge revenue, our gross margin in fiscal year 2017 was 18.2 percent compared to 17.7 percent in fiscal year 2016. The results reflect the impact of weaker demand across all end-use markets during the first half of fiscal year 2017 offset by improving demand conditions in the second half of fiscal year 2017 and operating cost improvements compared to fiscal year 2016. Our surcharge mechanism is structured to recover increases in raw material costs, although in certain cases with a lag effect as discussed above. While the surcharge generally protects the absolute gross profit dollars, it does have a dilutive effect on gross margin as a percent of sales. The following represents a summary of the dilutive impact of the surcharge on gross margin excluding the impact of the excess inventory write-down. We present and discuss these financial measures because management believes removing the impact of these items provides a more consistent and meaningful basis for comparing results of operations from period to period. See the section “Non-GAAP Financial Measures” below for further discussion of these financial measures. Selling, general and administrative expenses in fiscal year 2017 were $183.9 million, or 10.2 percent of net sales (11.8 percent of net sales excluding surcharge revenue), compared to $173.8 million, or 9.6 percent of net sales (11.1 percent of net sales excluding surcharge revenue), in fiscal year 2016. Selling, general and administrative expenses increased in fiscal year 2017 primarily due to higher variable compensation expense compared to fiscal year 2016. During fiscal year 2016, we incurred $18.0 million of restructuring and asset impairment charges. This included $7.6 million of non-cash impairment charges to write down property, plant and equipment and other intangible assets. The remaining $10.4 million consisted primarily of an early retirement incentive that resulted in a reduction of approximately 130 production and maintenance positions. No restructuring and asset impairment charges were incurred during the fiscal year 2017. Activities undertaken in connection with the fiscal year 2016 restructuring plan are complete. The Company’s Amega West and Specialty Steel Supply (“SSS”), prior to its divestiture, reporting units within the PEP Segment were significantly impacted by the prolonged weakness in oil and gas drilling and exploration activity driven by depressed oil prices. As a result, during the fiscal year 2016 we recorded an impairment charge of $12.5 million, which represented the entire balance of the goodwill recorded for these reporting units. No goodwill impairment charges were incurred during the fiscal year ended June 30, 2017. Our operating income in fiscal year 2017 increased to $97.2 million, or 5.4 percent of net sales as compared with $51.6 million, or 2.8 percent in net sales in fiscal year 2016. Excluding surcharge revenue, pension EID and special items, operating margin was 8.0 percent for the fiscal year 2017 and 8.5 percent for the same period a year ago. The decrease in the operating margin reflects the impact of weaker demand during the first half of fiscal year 2017 and higher variable compensation accruals partially offset by improving demand conditions in the second half of fiscal year 2017 and operating cost efficiencies compared to fiscal year 2016. Operating income has been significantly impacted by our pension EID, which may be volatile based on conditions in the financial markets, as well as other special items. The following presents our operating income and operating margin, in each case excluding the impact of surcharge on net sales, pension EID, the loss on divestiture of business, the excess inventory write-down, restructuring and asset impairment charges, goodwill impairment and other special items. We present and discuss these financial measures because management believes removing the impact of these items provides a more consistent and meaningful basis for comparing results of operations from period to period. See the section “Non-GAAP Financial Measures” below for further discussion of these financial measures. Fiscal year 2017 interest expense was $29.8 million compared to $28.0 million in fiscal year 2016. We have used interest rate swaps to achieve a level of floating rate debt to fixed rate debt. Interest expense for fiscal year 2017 includes net gains from interest rate swaps of $1.8 million compared with $2.6 million for fiscal year 2016. Other income for fiscal year 2017 was $2.8 million as compared with other expense of $2.1 million for fiscal year 2016. The results reflect positive impacts in foreign exchange gains of $2.0 million and favorable market return on investments used to fund company-owned life insurance contracts and investments held in rabbi trusts of $2.2 million for fiscal year 2017 compared to fiscal year 2016. Our effective tax rate (income tax expense as a percent of income before taxes) for fiscal year 2017 was 33.0 percent as compared to 47.4 percent in fiscal year 2016. As a result of the voluntary pension contribution, income tax expense for fiscal year 2017 includes a tax charge of $2.1 million due to reduced tax benefits for domestic manufacturing claimed in prior periods. The fiscal year 2017 tax rate also includes tax benefits of $0.9 million associated with the repatriation of earnings from one of our foreign subsidiaries and a tax charge of $0.9 million for prior year adjustments in various tax jurisdictions. The fiscal year 2016 tax rate includes the impact of non-cash goodwill impairment charges, a portion of which is non-deductible for tax purposes, as well as a tax charge of $2.8 million recorded as a result of a decision to sell our equity method investment in India. The fiscal year 2016 tax rate also includes net tax benefits of $0.8 million primarily for additional research and development credits as a result of the December 2015 enactment of the Protecting Americans from Tax Hikes Act of 2015. As of June 30, 2017, we had $99.1 million of indefinitely reinvested foreign earnings for which we had not provided deferred income taxes. Due to a change in foreign cash requirements for one of our foreign subsidiaries, we changed our intent with regard to indefinite reinvestment of foreign earnings of this subsidiary. As a result of this change, we repatriated $11.5 million of foreign earnings during fiscal year 2017 and recognized associated tax benefits of $0.9 million. The remaining balance of unremitted foreign earnings continues to be indefinitely reinvested. Net sales in fiscal year 2017 for the SAO segment decreased 1 percent to $1,461.6 million, as compared with $1,481.0 million in fiscal year 2016. Excluding surcharge revenue, net sales decreased 1 percent from a year ago. The fiscal year 2017 net sales reflected 3 percent lower shipment volume as compared to fiscal year 2016. The results reflect the impact of lower demand primarily in the Aerospace and Defense and Transportation end-use markets in the first half of fiscal year 2017 partially offset by improving demand conditions during the second half of fiscal year 2017 compared to fiscal year 2016. Operating income for the SAO segment in fiscal year 2017 was $172.3 million, or 11.8 percent of net sales (14.1 percent of net sales excluding surcharge revenue), compared to $176.9 million, or 11.9 percent of net sales (14.3 percent of net sales excluding surcharge revenue), for fiscal year 2016. The decrease in operating income reflects lower demand in the first half of the fiscal year 2017 partially offset by improving demand conditions during the second half of fiscal year 2017 and cost improvements driven by the implementation of the Carpenter Operating Model compared to fiscal year 2016. Net sales for fiscal year 2017 for the PEP segment were $366.6 million as compared with $358.7 million for fiscal year 2016. Excluding surcharge revenue, net sales were increased 2 percent from a year ago. The results reflect the increased net sales in the second half of fiscal year 2017 as a result of improved rental activity within the oil and gas businesses partially offset by lower shipment volume primarily in the Aerospace and Defense end-use market. Operating income for the PEP segment for fiscal year 2017 was $8.5 million, or 2.3 percent of net sales, as compared with operating loss of $5.5 million, or 1.5 percent of net sales for fiscal year 2016. The results reflect the improved rental activity within the oil and gas businesses in the second half of fiscal year 2017 and the positive impact of cost reduction initiatives partially offset by lower shipment volume primarily in the Aerospace and Defense end-use market. We ended fiscal year 2018 with $56.2 million of cash and cash equivalents, a decrease of $10.1 million from fiscal year 2017. During fiscal year 2018 our cash provided from operating activities was $209.2 million as compared with $130.3 million in fiscal year 2017. Our free cash flow, which we define under “Non-GAAP Financial Measures” below, was positive $34.7 million as compared to negative $16.8 million for the same period a year ago. The improvement in cash provided from operating activities in fiscal year 2018 compared to fiscal year 2017 was driven by higher income levels partially offset by associated working capital investments. Additionally, during fiscal year 2018, we made $6.7 million of required minimum pension contributions as compared with a voluntary pension contribution of $100.0 million, which was offset by cash tax benefits realized with the contribution of approximately $39.0 million, in the same period last year. Included in the free cash flow results during the current period, we acquired a business, MB CalRAM LLC, for a cash purchase price of $13.3 million. In the same period last year, we acquired a business, Puris LLC, for a cash purchase price of $35.3 million and received $12.0 from the divestiture of the SSS business. The free cash flow results also reflect higher capital spending levels in the current period as we increased our investment in key growth initiatives during fiscal year 2018. Capital expenditures for property, equipment and software were $135.0 million for fiscal year 2018 as compared to $98.5 million for fiscal year 2017. In fiscal year 2019, we expect capital expenditures to be approximately $190 million. Dividends for fiscal year 2018 were $34.4 million, as compared with $34.1 million in the prior year and were paid at the same quarterly rate of $0.18 per share of common stock in both periods. For the fiscal years ended June 30, 2018, 2017 and 2016, interest costs totaled $31.1 million, $31.1 million and $29.9 million, respectively, of which $2.8 million, $1.3 million and $1.9 million, respectively, were capitalized as part of the cost of property, plant, equipment and software. During fiscal year 2018, we made required minimum pension contribution of $6.7 million to one our qualified pension plans, and are required to make cash contributions of $5.5 million during fiscal year 2019. Over the next five years, current estimates indicate that we will be required to make about $92.4 million of cash contributions to our pension plans, based on the laws in effect for pension funding as of June 30, 2018, and subject to market returns and interest rate assumptions. We have demonstrated the ability to generate cash to meet our needs through cash flows from operations, management of working capital and the availability of outside sources of financing to supplement internally generated funds. We generally target minimum liquidity, consisting of cash and cash equivalents added to available borrowing capacity under our credit agreement, of $150.0 million. On March 31, 2017, we entered into a new $400.0 million Credit Agreement (the “Credit Agreement”) that extends to March 2022. As of June 30, 2018, we had $6.0 million of issued letters of credit. The balance of the Credit Agreement ($394.0 million as of June 30, 2018) remains available to us. As of June 30, 2018, we had total liquidity of $450.2 million, including $56.2 million of cash and cash equivalents. The Credit Agreement provides flexibility to fund our ongoing cash requirements as needed. From time to time during the year ended June 30, 2018 we have borrowed under our Credit Agreement and subsequently repaid any outstanding borrowings prior to June 30, 2018. The weighted average daily borrowing under the Credit Agreement during the year ended June 30, 2018 was $9.8 million with daily outstanding borrowings ranging from $0.0 million to $32.2 million. We evaluate liquidity needs for alternative uses including funding external growth opportunities, share repurchases as well as funding consistent dividend payments to stockholders. Over the last several years, we declared and paid quarterly cash dividends of $0.18 per share. As of June 30, 2018, we had cash and cash equivalents of approximately $20.0 million held at various foreign subsidiaries. Our global cash deployment considers, among other things, the geographic location of our subsidiaries’ cash balances, the locations of our anticipated liquidity needs and the cost to access international cash balances, as necessary. The Act requires a one-time tax on previously deferred foreign earnings and generally provides for tax-free repatriations of these earnings beginning January 1, 2018. During the fiscal year ended June 30, 2018, we repatriated cash of $9.2 million from foreign jurisdictions. From time to time, we may make short-term intercompany borrowings against our cash held outside the United States in order to reduce or eliminate any required borrowing under our Credit Agreement. We are subject to certain financial and restrictive covenants under the Credit Agreement, which, among other things, require the maintenance of a minimum interest coverage ratio (3.50 to 1.00 as of June 30, 2018). The interest coverage ratio is defined in the Credit Agreement as, for any period, the ratio of consolidated earnings before interest, taxes, depreciation and amortization and non-cash net pension expense (“EBITDA”) to consolidated interest expense for such period. The Credit Agreement also requires the Company to maintain a debt to capital ratio of less than 55 percent. The debt to capital ratio is defined in the Credit Agreement as the ratio of consolidated indebtedness, as defined therein, to consolidated capitalization, as defined therein. As of June 30, 2018, the Company was in compliance with all of the covenants of the Credit Agreement. We continue to believe that we will maintain compliance with the financial and restrictive covenants in future periods. To the extent that we do not comply with the covenants under the Credit Agreement, this could reduce our liquidity and flexibility due to potential restrictions on borrowings available to us unless we are able to obtain waivers or modifications of the covenants. This report includes discussions of net sales as adjusted to exclude the impact of raw material surcharge and the resulting impact on gross margins, as well as the excess inventory write-down, which represent financial measures that have not been determined in accordance with U.S. GAAP. We present and discuss these financial measures because management believes removing the impact of raw material surcharge from net sales and cost of sales provides a more consistent basis for comparing results of operations from period to period for the reasons discussed earlier in this report. In addition, management believes that excluding the excess inventory write-down from gross profit and gross margin is helpful in analyzing our operating performance as the excess inventory write-down is not indicative of ongoing operating performance. Management uses its results excluding these amounts to evaluate its operating performance and to discuss its business with investment institutions, the Company’s board of directors and others. See our earlier discussions of “Gross Profit” for reconciliations of net sales and gross margin, excluding surcharge revenue and the excess inventory write-down, to net sales as determined in accordance with U.S. GAAP. Net sales and gross margin excluding surcharge revenue and the excess inventory write-down is not a U.S. GAAP financial measure and should not be considered in isolation of, or as a substitute for, net sales and gross margin calculated in accordance with U.S. GAAP. This report includes discussions of operating income and operating margin as adjusted to exclude the impact of raw material surcharge revenue, pension EID and special items which represent financial measures that have not been determined in accordance with U.S. GAAP. We present and discuss these financial measures because management believes removing the impact of raw material surcharge from net sales and cost of sales provides a more consistent and meaningful basis for comparing results of operations from period to period for the reasons discussed earlier in this report. In addition, management believes that excluding pension EID and special items from operating income and operating margin is helpful in analyzing our operating performance particularly as pension EID may be volatile due to changes in the financial markets and special items are not indicative of ongoing operating performance. Management uses its results excluding these amounts to evaluate its operating performance and to discuss its business with investment institutions, the Company’s board of directors and others. See our earlier discussion of operating income for a reconciliation of operating income and operating margin excluding pension EID and special items to operating income and operating margin determined in accordance with U.S. GAAP. Operating income and operating margin excluding surcharge revenue, pension EID and special items is not a U.S. GAAP financial measure and should not be considered in isolation of, or as a substitute for, operating income and operating margin calculated in accordance with U.S. GAAP. * Impact per diluted share calculated using weighted average common shares outstanding of 47.6 million for the year ended June 30, 2018. * Impact per diluted share calculated using weighted average common shares outstanding of 47.1 million for the year ended June 30, 2017. (a) The income tax effect of the special items during fiscal year 2017 was determined using a normalized effective income tax rate at the time of 35 percent. (b) Discrete income tax charge recorded as a result of reduced tax benefits claimed in prior years in connection with the Company’s $100 million voluntary pension contribution made in October 2016. Management believes that the presentation of earnings per share adjusted to exclude the impacts of special items is helpful in analyzing the operating performance of the Company, as these items are not indicative of ongoing operating performance. Management uses its results excluding these amounts to evaluate its operating performance and to discuss its business with investment institutions, the Company's board of directors and others. Our definitions and calculations of these items may not necessarily be the same as those used by other companies. Adjusted earnings per share is not a U.S. GAAP financial measure and should not be considered in isolation of, or as a substitute for, earnings per share calculated in accordance with U.S. GAAP. Management believes that the presentation of free cash flow provides useful information to investors regarding our financial condition because it is a measure of cash generated which management evaluates for alternative uses. It is management’s current intention to use excess cash to fund investments in capital equipment, acquisition opportunities and consistent dividend payments. Free cash flow is not a U.S. GAAP financial measure and should not be considered in isolation of, or as a substitute for, cash flows calculated in accordance with U.S. GAAP. The preparation of the consolidated financial statements in conformity with generally accepted accounting principles requires management to make estimates and assumptions that affect the amounts of assets and liabilities and disclosure of contingent assets and liabilities at the date of the financial statements and the reported amounts of revenues and expenses during the reporting period. Actual results could differ from those estimates. On an on-going basis, we evaluate our estimates, including those related to bad debts, customer claims, inventories, goodwill, intangible assets, income taxes, pensions and other postretirement benefits, contingencies and litigation, environmental liabilities and derivative instruments and hedging activities. We believe the following are the critical accounting policies and areas affected by significant judgments and estimates impacting the preparation of our consolidated financial statements. We maintain an allowance for doubtful accounts for estimated losses resulting from the failure of our customers to make required payments. We perform ongoing credit evaluations of our customers and monitor their payment patterns. Should the financial condition of our customers deteriorate, resulting in an impairment of their ability to make payments, additional allowances may be required. Inventories are stated at the lower of cost or market. The cost of inventories is primarily determined using the LIFO method. We also use the FIFO and average cost methods. As of June 30, 2018 and 2017, $138.6 million and $107.3 million of inventory, respectively, was accounted for using a method other than the LIFO method. Costs include direct materials, direct labor, applicable manufacturing overhead and other direct costs. Under the LIFO inventory valuation method, changes in the cost of raw materials and production activities are recognized in cost of sales in the current period even though these materials and other costs may have been incurred at significantly different values due to the length of time of our production cycle. The prices for many of the raw materials we use have been volatile. Since we value most of our inventory utilizing the LIFO inventory costing methodology, rapid changes in raw material costs have an impact on our operating results. In a period of rising prices, cost of sales expense recognized under LIFO is generally higher than the cash costs incurred to acquire the inventory sold. Conversely, in a period of declining raw material prices, cost of sales recognized under LIFO is generally lower than cash costs incurred to acquire the inventory sold. Since the LIFO inventory valuation methodology is designed for annual determination, interim estimates of the annual LIFO valuation are required. We recognize the effects of the LIFO inventory valuation method on an interim basis by estimating the expected annual LIFO cost based on cost changes to date. These projections of annual LIFO inventory valuation reserve changes are updated quarterly and are evaluated based upon material, labor and overhead costs. The amount of the pension expense, which is determined annually, is based upon the value of the assets in the pension trusts at the beginning of the fiscal year as well as actuarial assumptions, such as the discount rate and the expected long-term rate of return on plan assets. The assumed long-term rate of return on pension plan assets is reviewed at each year-end based on the plan’s investment policies, an analysis of the historical returns of the capital markets and current interest rates. Based on the current funding level, the allocation policy for pension plan assets is to have approximately 60 percent in return seeking assets and 40 percent in liability matching assets. Return seeking assets include domestic and international equities and diversified loan funds. Liability matching assets include long duration bond funds. As the funding level of the plans improves in increments of 5 percent, assets will be shifted from return seeking to liability matching in increments of 4 percent as a de-risking strategy. The plan discount rate is determined by reference to the Bond:Link interest rate model based upon a portfolio of highly rated U.S. corporate bonds with individual bonds that are theoretically purchased to settle the plan’s anticipated cash outflows. The fluctuations in stock and bond markets could cause actual investment results to be significantly different from those assumed, and therefore, significantly impact the valuation of the assets in our pension trusts. Changes in actuarial assumptions could significantly impact the accounting for the pension assets and liabilities. If the assumed long-term rate of return on plan assets was changed by 0.25 percent, the net pension expense would change by $2.6 million. If the discount rate was changed by 0.25 percent, the net pension expense would change by $0.8 million. Long-lived assets are reviewed for impairment and written down to fair value whenever events or changes in circumstances indicate that the carrying value may not be recoverable through estimated future undiscounted cash flows. The amount of the impairment loss is the excess of the carrying amount of the impaired assets over the fair value of the assets based upon estimated future discounted cash flows. We evaluate long-lived assets for impairment by individual business unit. Changes in estimated cash flows could have a significant impact on whether or not an asset is impaired and the amount of the impairment. Goodwill is not amortized but instead is at least annually tested for impairment as of June 30, or more frequently if events or circumstances indicate that the carrying amount of goodwill may be impaired. Potential impairment is identified by comparing the fair value of a reporting unit to its carrying value. The fair value is estimated using discounted cash flows and the use of market multiples valuation techniques. If the carrying value of the reporting unit exceeds its fair value, any impairment loss is measured by comparing the carrying value of the reporting unit’s goodwill to its implied fair value. The discounted cash flow analysis for each reporting unit tested requires significant estimates and assumptions related to cash flow forecasts, discount rates, terminal values and income tax rates. The cash flow forecasts are developed based on assumptions about each reporting unit’s markets, product offerings, pricing, capital expenditure and working capital requirements as well as cost performance. The discount rates used in the discounted cash flow are estimated based on a market participant’s perspective of each reporting unit's weighted average cost of capital. The terminal value, which represents the value attributed to the reporting unit beyond the forecast period, is estimated using a perpetuity growth rate assumption. The income tax rates used in the discounted cash flow analysis represent estimates of the long-term statutory income tax rates for each reporting unit based on the jurisdictions in which the reporting units operate. As of June 30, 2018, we had five remaining reporting units with goodwill recorded. Goodwill associated with our SAO reporting unit is tested at the SAO segment level and represents approximately 73 percent of our total goodwill. All other goodwill is associated with our PEP segment, which includes four reporting units with goodwill recorded. As of June 30, 2018, the fair value of the SAO reporting unit exceeded the carrying value by approximately 41 percent. The goodwill recorded related to the SAO reporting unit as of June 30, 2018 was $195.5 million. The discounted cash flows analysis for the SAO reporting unit includes assumptions related to our ability to increase volume, improve mix, expand product offerings and continue to implement opportunities to reduce costs over the next several years. For purposes of the discounted cash flow analysis for SAO’s fair value, we used a weighted average cost capital of 9.5 percent and a terminal growth rate assumption of 3 percent. The estimate of fair value requires significant judgment. We based our fair value estimates on assumptions that we believe to be reasonable but that are unpredictable and inherently uncertain, including estimates of future growth rates and operating margins and assumptions about the overall economic climate and the competitive environment for our business units. There can be no assurance that our estimates and assumptions made for purposes of our goodwill and identifiable intangible asset testing as of the time of testing will prove to be accurate predictions of the future. If our assumptions regarding business projections, competitive environments or anticipated growth rates are not correct, we may be required to record goodwill and/or intangible asset impairment charges in future periods, whether in connection with our next annual impairment testing or earlier, if an indicator of an impairment is present before our next annual evaluation. Environmental expenditures that pertain to current operations or to future revenues are expensed or capitalized consistent with Carpenter’s capitalization policy for property, plant and equipment. Expenditures that result from the remediation of an existing condition caused by past operations and that do not contribute to current or future revenues are expensed. Liabilities are recognized for remedial activities when the remediation is probable and the cost can be reasonably estimated. Most estimated liabilities are not discounted to present value due to the uncertainty as to the timing and duration of expected costs. For one former operating facility site, due to the routine nature of the expected costs, the liability for future costs is discounted to present value over 20 years assuming a discount rate of approximately 3 percent as of June 30, 2018 and 2017. Deferred income taxes result from temporary differences in the recognition of income and expense for financial and income tax reporting purposes, or differences between the fair value of assets acquired in business combinations accounted for as purchases for financial reporting purposes and their corresponding tax bases. Deferred income taxes represent future tax benefits (assets) or costs (liabilities) to be recognized when those temporary differences reverse. We evaluate on a quarterly basis whether, based on all available evidence, we believe that our deferred income tax assets will be realizable. Valuation allowances are established when it is estimated that it is more likely than not that the tax benefit of the deferred tax assets will not be realized. The evaluation includes the consideration of all available evidence, both positive and negative, regarding historical operating results including recent years with reported losses, the estimated timing of future reversals of existing taxable temporary differences, estimated future taxable income exclusive of reversing temporary differences and carryforwards, and potential tax planning strategies which may be employed to prevent an operating loss or tax credit carryforward from expiring unused. Future realization of deferred income tax assets ultimately depends upon the existence of sufficient taxable income within the carryback or carryforward period available under tax law. Management determines whether a tax position should be recognized in the financial statements by evaluating whether it is more likely than not that the tax position will be sustained upon examination by the tax authorities based upon the technical merits of the position. For those tax positions which should be recognized, the measurement of a tax position is determined as being the largest amount of benefit that is greater than 50 percent likely of being realized upon ultimate settlement. Interest and penalties on estimated liabilities for uncertain tax positions are recorded as components of the provision for income taxes. Our current risk management strategies include the use of derivative instruments to reduce certain risks. The critical strategies include: (1) the use of commodity forward contracts to fix the price of a portion of anticipated future purchases of certain raw materials and energy to offset the effects of changes in the costs of those commodities; and (2) the use of foreign currency forward contracts to hedge a portion of anticipated future sales denominated in foreign currencies, principally the Euro and Pound Sterling, in order to offset the effect of changes in exchange rates. The commodity forwards and foreign currency forwards have been designated as cash flow hedges and unrealized net gains and losses are recorded in the accumulated other comprehensive loss component of stockholders’ equity. The unrealized gains or losses are reclassified to the income statement when the hedged transaction affects earnings or if the anticipated transactions are no longer expected to occur. We use interest rate swaps to maintain a certain level of floating rate debt relative to fixed rate debt. Interest rate swaps have been designated as fair value hedges. Accordingly, the mark-to-market values of both the interest rate swap and the underlying debt obligations are recorded as equal and offsetting gains and losses in the interest expense component of the consolidated statement of income. We have also used forward interest rate swaps to manage the risk of cash flow variability associated with fixed interest debt expected to be issued. We evaluate all derivative instruments each quarter to determine that they are highly effective. Any ineffectiveness is recorded in our consolidated statement of income. We also use foreign currency forward contracts to protect certain short-term asset or liability positions denominated in foreign currencies against the effect of changes in exchange rates. These positions do not qualify for hedge accounting and accordingly are marked-to-market at each reporting date through charges to other income and expense. For information with respect to new accounting pronouncements and the impact of these pronouncements on our consolidated financial statements, see Note 20 to Notes to Consolidated Financial Statements included in Item 8, “Financial Statements and Supplementary Data”. We had no off balance sheet arrangements during the periods presented.